High factor sun protection cream spf50+, ideal for normal to dry skin. 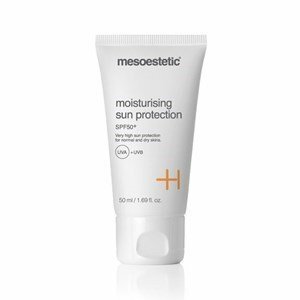 In its composition, Moisturizing Sun Protection has a hydrating complex and offers a faster recovery before any environmental aggression on the skin tissue. Thanks to its moisturizing and antioxidants properties, it is the indispensable complement for all kinds of treatment involving dehydration of the epidermis. In prolonged exposure to the sun, it is advisable to renew the application of the product every 2-3 hours. Avoid sun exposure between 12pm and 4pm. The Mesoestetic offers numerous sthetic treatments that momentarily raise the skin sensitivity (dermoabrasions, peelings, etc.) wich makes extremely necessary, the protection against aggressions and potential injuries created by sun exposure and the UVA and UVB radiation.